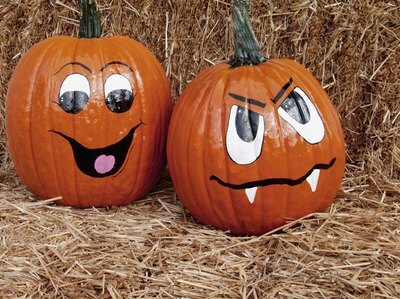 Decorating pumpkins appeals to adults and kids, especially as Halloween nears. A pumpkin-decorating contest fosters a competitive yet friendly environment for participants. The contest works well in a number of settings including classrooms, homes, fall carnivals or festivals, Halloween parties and other fall gatherings. Add a theme to the pumpkin-decorating contest for a creative twist. The theme depends in part on the age group and purpose of the contest. For instance, a kids' church youth group might have a religious theme while an adult Halloween party would have a more secular theme. 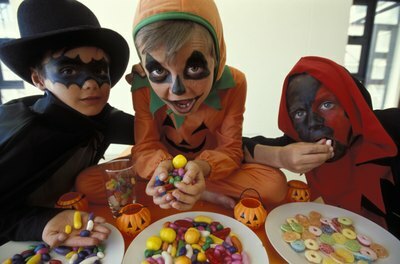 Theme ideas include TV shows, animals, kids' characters or sports. Choose a theme that is broad enough to allow for creativity. A painted pumpkin contest is ideal for kids. It is much safer than carving pumpkins yet still allows the participants to demonstrate their creativity. Painting the pumpkins also eliminates the sticky mess created by the seeds and insides of the pumpkins. Provide enough paint so that all of the participants can easily access it. Plastic sheets or newspapers on work surfaces protect them from paint spills. For a more traditional pumpkin decorating contest, let the guests carve their pumpkins. This is best for adults who are better able to handle sharp carving tools. Decide if you will provide the knives and carving tools or if each person will be responsible for bringing her own. You'll also need to decide if patterns are allowed or if the carving will be freehand only. Decide how the pumpkin contest entries will be judged. One option is to assign one or two people as the judges. The judges shouldn't participate in the contest to make sure it's a fair competition. Another option is to let the participants vote with the restriction that they can't vote for their own pumpkins. Consider how many prizes you will offer. Ideas for the awards might include most creative, best overall, funniest pumpkin or best use of resources. The award names can be serious or humorous. 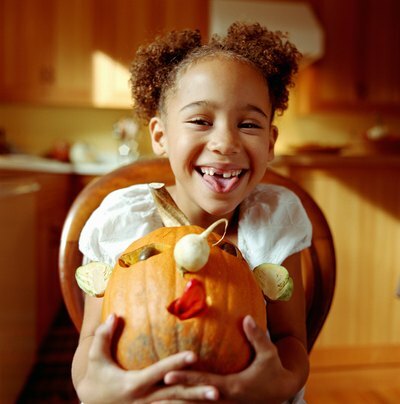 A pumpkin decorating contest holds the potential as a fundraiser for a group or project. Having local celebrities participate in the contest might draw more people. The pumpkins can raise funds in different ways. Tie the fundraising into the voting by placing a can in front of each pumpkin. The people who attend the fundraiser place money in the can of their favorite pumpkins. The pumpkin that raises the most money is the winner. Another option is to auction off the decorated pumpkins.